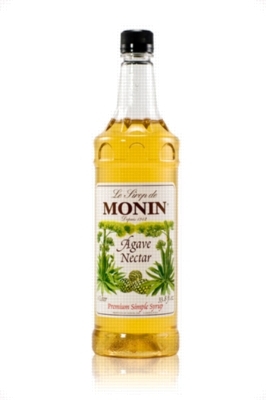 Made with organic Agave , Monin Agave Nectar offers the true, unique agave nectar taste; similar to sugar, yet sweeter, with honey-nutty-notes. Use Agave Nectar in place of sugar in many applications; dissolves instantly for additional versatility. *A low glycemic index means that the food or beverage does not cause sudden spikes in blood sugar levels. Color: Clear, almost colorless with a golden tinge. Tasting Notes: Similar to sugar yet sweeter, with honey-nutty notes. Applications: Iced and hot coffees & teas, specialty coffee beverages, cocktails, baking, lemonades & smoothies. Tips: A great substitute for sugar or simple syrup with a wide range of uses. 1 pump of Monin Agave Nectar achieves at least the same sweetness level of one sugar packet, but with fewer calories and carbohydrates. Enhances the Agave notes contained in tequila; for the perfect Margarita, combine Agave Nectar with fresh lime juice to make your own sweet & sour mix, then add tequila.